Dazio IV Black Freestanding Soaking Tub 70"
Name: Dazio IV Black Freestanding Soaking Tub 70"
Dazio Red Freestanding Soaking Tub 73"
Dazio Freestanding Soaking Tub 73"
Dazio IV Black Freestanding Soaking Tub Modern Cast Stone 70"
The Dazio IV modern bathtub is the answer to ultimate contemporary functionality and beauty at its best. The Dazio IV modern freestanding bathtub is a solid surface, luxury bathtub with a polished finish incorporating romantic elements with modern flare. Common bathtubs are hollow and made of fiberglass. However, the solid surface bathtub is made of crushed stone mixed with molecular compounds and advance composite materials, thus allowing one to enjoy the hypo-allergenic properties inert stone provides. The luxury modern solid surface bathtub works as a natural bacteria deterrent since its non-porous composition does not allow for moisture to reside in the stone bathtub walls. 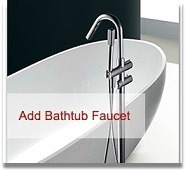 This results in a stain resistant modern bathtub that is hygienically advanced and easy to clean. In addition, function does not suppress beauty as this masterfully crafted modern freestanding bathtub also includes a overflow feature. This graceful one piece soaking bathtub reinforces its appealing design as an exciting staple in any modern bathroom d?cor without compromising the relaxing look or feel of sheer classical elegance. The neo classical egg-shaped, freestanding bathtub design will invoke a feeling of absolute luxury while offering a silky velvet touch enabling the clean sleek lines of modern bathroom design to flourish in any modern bathroom d?cor plan.